Because of a bunch of the Browncoats here, I will get to represent Browncoats everywhere by going to the Gulf and helping out. A number of our members, knowing my love of such things and my rehabilitation and oil cleanup in the past, got together and are paying my air fare out there. It may not be for quite some time, as they've got tons of volunteers now and when some of them get sick (as some already have), have to return to work, or just burn out, that's when they'll need the rest of us. I'm proud to go and can't wait; they may have to retrain me (since my oil work was back in the late '70s and in 2007 when the Cosco Busan hit the Bay Bridge here in SF), but if they don't want to, I'll do whatever job they give me. This is Rodeo Beach, on the Marin Headlands, and the barge that washed ashore there which gave me my only experience cleaning oil-soaked birds. Thankfully it was only a small one; I cannot conceive of what they're experiencing down on the Gulf! 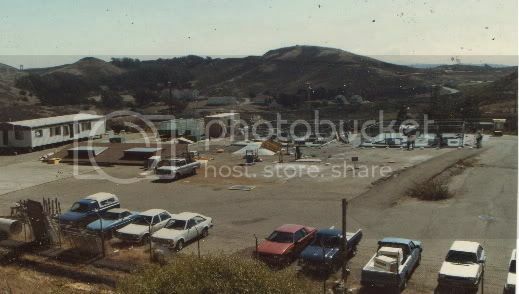 The old Marine Mammal Center where I was working at the time is barely visible up the hill on the right; all the other buildings were army buildings which were left when the military abandoned the facility and which are now inhabited by many non-profit organizations. 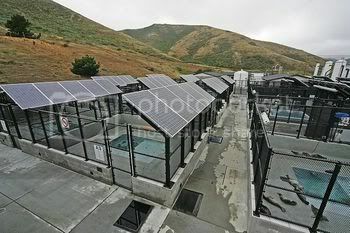 All this got me to thinking of my previous rehab work at Marine Mammal Center, which began in 1975 and is now a huge, gorgeous facility. 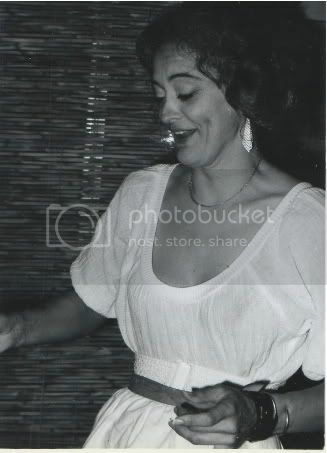 But when I wroked there in the late '70s, we were a fledgling organization, so for the fun of it I scanned some of my photos from back then to show and tell you a bit about them. 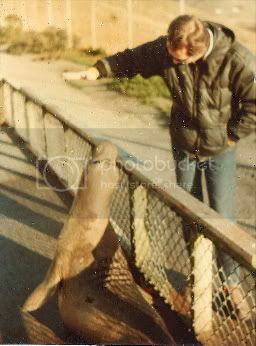 MMC rehabs seals and sea lions. It was begun in the Marin Headlands on top of two abandoned Nike missle silohs by three people. 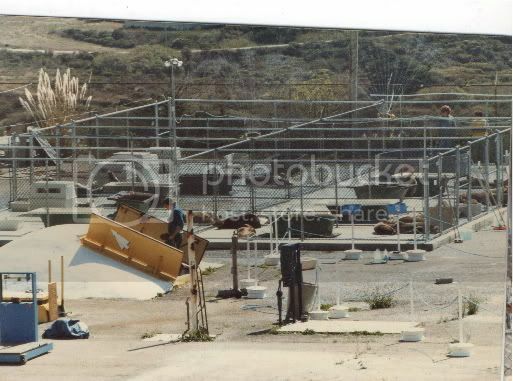 When I began work there, we had nothing but a paved surface, one building and the silohs (which are still used to house the freezers where they keep the food). 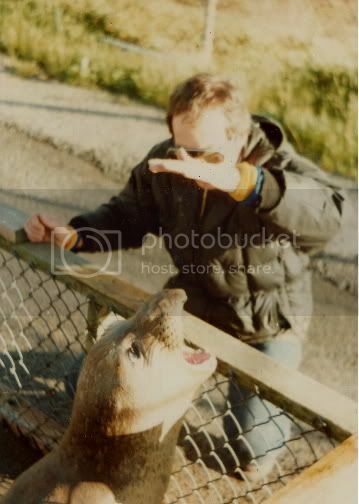 The first pens were no more than three feet high and as such we couldn't take in sea lions, and even the elephant seals and harbor seals we took in often pushed the fences over, making us chase them around on foot and with our cars to get them back in pens. 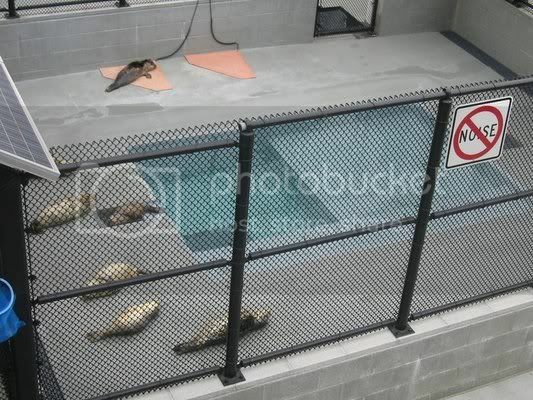 Volunteers built wooden ramps up to the tubs for the seals to get in and out. This is some of what I was proudest of the things we did in this photo. This little harbor seal came in horribly mangled from getting hit by a propeller. I, and others, didn't think he could possibly make it. 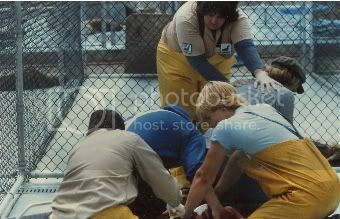 But he did--this photo is about halfway through his rehab, you can still see the three gashes he suffered. The scars remained, but this little guy healed completely and was returned to the wild. You can imagine how that felt! All the work was hard, with a few exceptions. 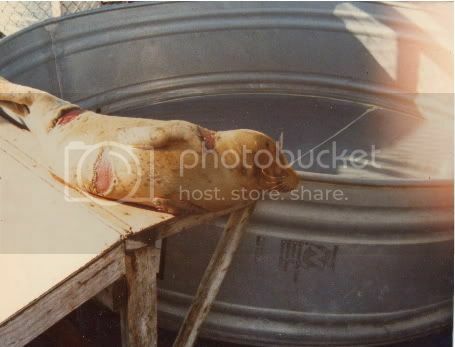 We had to deal with emaciated, near-dead animals, lots and lots of pups and sub-adults brought in from many different disease, injury, abandonment, pieces of plastic wrapped around their necks, and many more things. We had to treat them with the help of a volunteer vet, tube feed the weebers then force-feed them fish, then wave fish in the water so they'd learn to catch them for themselves. Most were released on Rodeo Beach right below the center; in some cases the Coast Guard would take us out to the Farallon Islands, just off our coast, which is a "haul out" for seals and sea lions and we'd let them go off the boat. 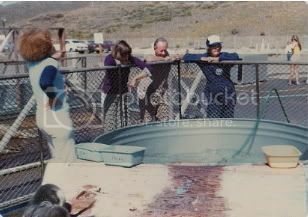 At the time I was last there, we even had sprinklers for the pens, because although it's more often cold and foggy out there, in Summer it gets quite hot. So we no longer had to hose off the animals almost hourly, and there had been built some of what we thought were really spiffy ramps of heavy-duty plastic...much easier to clean! After that I visited now and again, and was disappointed when I couldn't take Choey--who moved out here from Michigan three years ago to live with us--to see it, because they were closed down for nearly a year to rebuild a new facility. MMC was always good at getting media coverage and donations. I don't know how much this puppy cost, but it must have been in the millions. It opened late last year, and a few months ago was the first time we were out there and I could take Choey up. It was a major shock. Last weekend we took the dogs to Rodeo Beach and I asked Jim if he'd like to see the new facility. He walked around with his jaw on the ground, much as I had. It's amazing. It's huge...they have their own water-treatment system now, so they no longer dump waste water in the lagoon below, which was a real bone of contention in my day. The can boast now that they treat "every species of marine mammal found along California's northern coast, including pinnipeds like California sea lions, northern elephant seals, harbor seals, sea otters, whales, dolphins, porpoises, and even sea turtles." Heavy-duty fencing, shade screens they can roll out on hot days, sprinklers, and even built-in pools with plumbing, at two depths no less! I'm so happy for them all; the shifts must be SO much easier for the crews, and the animals of course have it fantastic now. 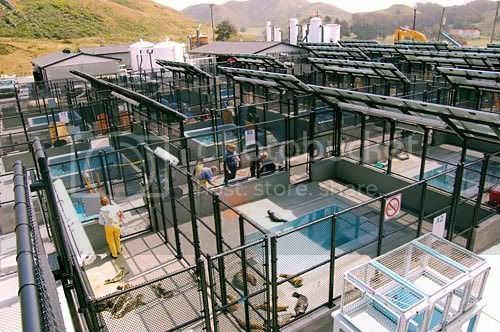 They handle approximately 600 animals a year, whereas we were pushed to handle more than 100 when I left. So. Someone on the website I run for mental illness said I was a "Don Quixote" going to the Gulf. I can't make anyone feel what I've felt; that every life saved is a victory. But I can guarantee you that's true; every time you see an animal that would have died without your help returned to the wild, it feels like a major victory over what man or nature has wrought. This may be my last chance to do any hands-on work in rehab or even helping save something from an oil spill, so I really treasure the opportunity and can't express thanx enough to the wonderful Browncoats from here who helped make it possible! I may not be able to do the physical stuff I used to back then, but despite my age and various infirmities, I'm thinking of going back to work at MMC in some capacity. It'll be pretty cushy if I do, compared to then.